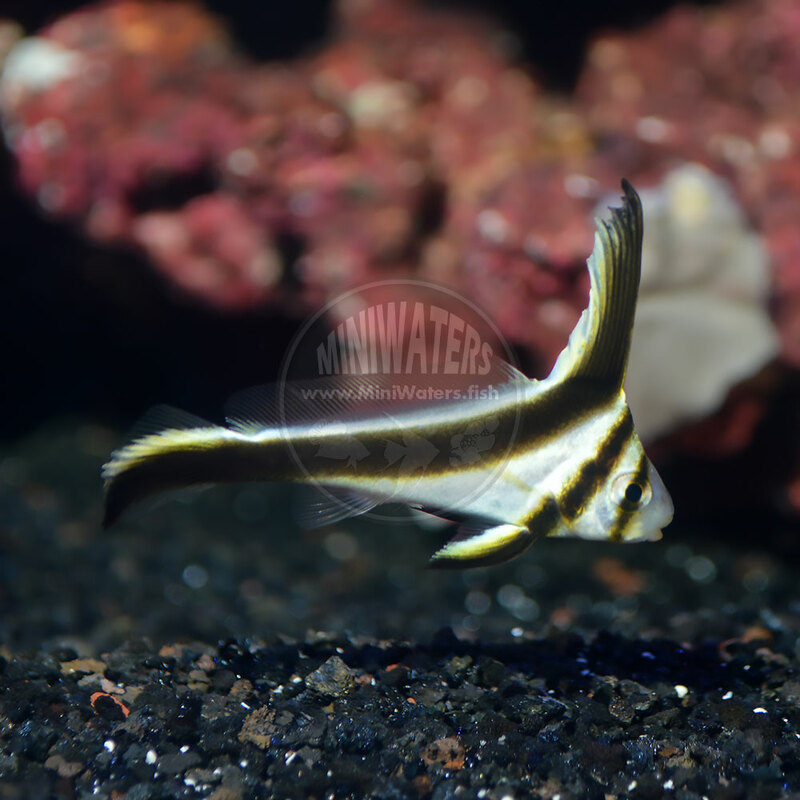 Time To Make Good – Captive Bred Jackknifes are back! The following is an excerpt from the MiniWaters email that goes out to our wholesale customers; if you’re a LFS owner looking for well-conditioned marine and freshwater fish, with an eye towards captive-bred livestock, let’s chat. Shoot me a wholesale inquiry today. Equetus lanceolatus ‘Jackknife Fish”, captive-bred, Proaquatix – the 2017 crop was on display at MACNA in New Orleans at the end of August. I have to point out the captive-bred Jackknifes (Equetus lanceolatus) from Proaquatix; right now they are at the PERFECT size, around 2”. I’d love to bring in a lot more of these to get them into the hobby while the year’s crop is at this ideal size, but that requires you guys putting ‘em in your shops to sell them. They’re a good example of a showy fish that in principle should be reef-safe; they are predators, and can reach a respectable size of around 9”, but their main focus is going to be inverts (eg. shrimps), and *possibly* small fish, although that’s up for debate. This is a perfect example of a captive-bred marine fish that is superior to wild-caught versions in every way. They’re more robust; they simply don’t have disease issues like wild ones. They pound pellet foods. The size is far better than what you usually see from the wild. The PRICE is actually pretty good too; most online retailers have wild JackKnifes in the $100-$150+ range (yes, there are a few outliers that are lower…but I suppose that will always happen), but of course, I challenge you to find them AVAILABLE, particularly now after Hurricane Irma just devastated the Florida Keys. 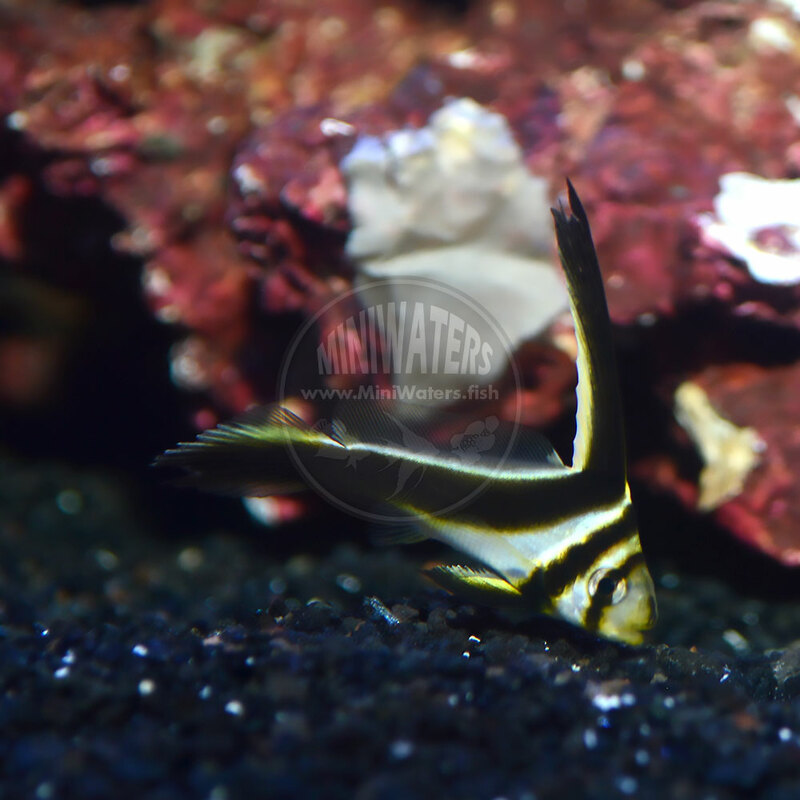 If we don’t promote and sell fishes like these Captive-bred Jackknifes, I just see a future where a company like Proaquatix would stop producing them, and that’s not a future I want to see! I’m already taking less than my normal markup to offer these at a wholesale level, so please give them some serious consideration this week! Remember, if you’re in my SpeeDee Delivery zone, shipping is generally going to be less than $10 a box; I challenge you to show me Air Cargo, FedEx, or UPS at that rate (unless they’re giving you free shipping, but hey, $10 a box is still highly competitive in my book)! You can learn more about the captive-bred Jackknife fish, or make a retail purchase, here on MiniWaters.fish. If you’re a LFS owner/manager and you like my way of thinking, why not get on our wholesale distribution list? Shoot me a wholesale inquiry today. At 2″, these captive-bred Equetus lanceolatus ‘Jackknife Fish” from Proaquatix are just PERFECT. Get yours today! 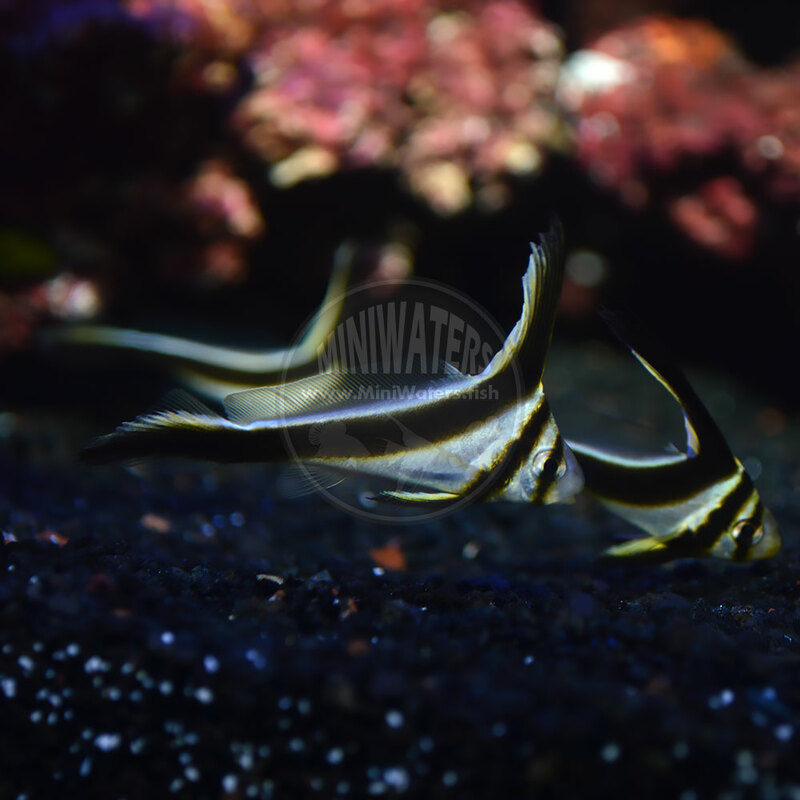 This entry was posted in Insights, New Saltwater Arrivals and tagged captive-bred, Equetus lanceolatus, Jackknife Fish, LFS, Proaquatix. So You Want To Start A Fish Breeding Business? I'm in love with the Ultra and Premium [Lightning Maroon Clownfish] I got through MiniWaters! Two thumbs up and awesome quality! Top of my list for future orders! Matt with MiniWaters.Fish has excellent customer service skills throughout the order process. From timely email responses, to going the extra mile to find the fish you want, and the added plus of what seems to be unlimited knowledge for the fish he sells. MiniWaters.Fish will definitely be at the top of my list for future orders! They did great! All looked perfect. You packed the hell out of them. Wife thought I bought a couple dozen fish. Look forward to ordering from you again in the future and will spread the word around here about your stellar service. Thanks again! The Best To Work With! The fish are gorgeous! Amazing coloration, and appear to be super healthy...I've ordered from a dozen retailers, and you have by far been the best to work with. The communication between buyer and seller was bar-none. Miniwaters is an amazing company. I bought 2 fancy clowns aka "davinci" clowns, and the communication between buyer and seller was bar-none. The fish themselves are amazing, and delivered promptly. Best option in the Midwest by far. You’re the best…You need to be cloned! You're the best! I really appreciate all the time you've spent with me...You need to be cloned, greatest email reply I've ever received. Your packing technique is extraordinary and the fish are even better!!!!!!!!!!!!! Completely satisfied! Ordered a few fish from Miniwaters for future projects. Triple bagged and warm. Great shipping. Easy transaction. Thanks Matt. Fish were packaged in a huge box; they traveled in luxury! My shipping was only $8 from MiniWaters.FISH today and fish were packaged in a huge box. They traveled in luxury! Large box, double bagged and then one more bag overall for good measure. Plenty of water and air and some bonus reading material for me, a couple of recent editions of Coral Magazine. Very happy customer! The fish are clearly healthy, have good appetites, and are busy exploring their new home. There were no DOA's. Thank you very much for a job well done! I don’t leave many reviews, but credit where it’s due! Ordered from MiniWaters.fish before, great livestock, communication about shipping, and really cares that it arrives alive! Overall A++. I don’t leave many reviews, but credit where it’s due! Always been a pleasure working with you, and I really enjoy supporting small businesses! I really appreciate your amazing customer service throughout this process; it was absolutely exceptional! I will definitely be shopping with you in the future! Fish arrived less stressed than some I have bought in local shops! I was impressed by the way these fish were packed. The fish were triple bagged, and they were nestled in nicely among the air pillows, both reducing shock from the package being bounced around in transit, and buffering against temperature problems. The fish were about as un-stressed as one could imagine, given a 24-hour trip. Honestly, they seemed less stressed than some fish that I have bought in local shops and brought back to the lab directly. Came highly recommended and didn’t disappoint! The little guy made it safe and sound to us this morning. You were not kidding about the packing! Great job! Have him drip acclimating right now. Thanks again for the fantastic service! Couldn't be happier with my MiniWaters experience. You came highly recommended from a friend of mine and you didn't disappoint. I look forward to doing business with you again!